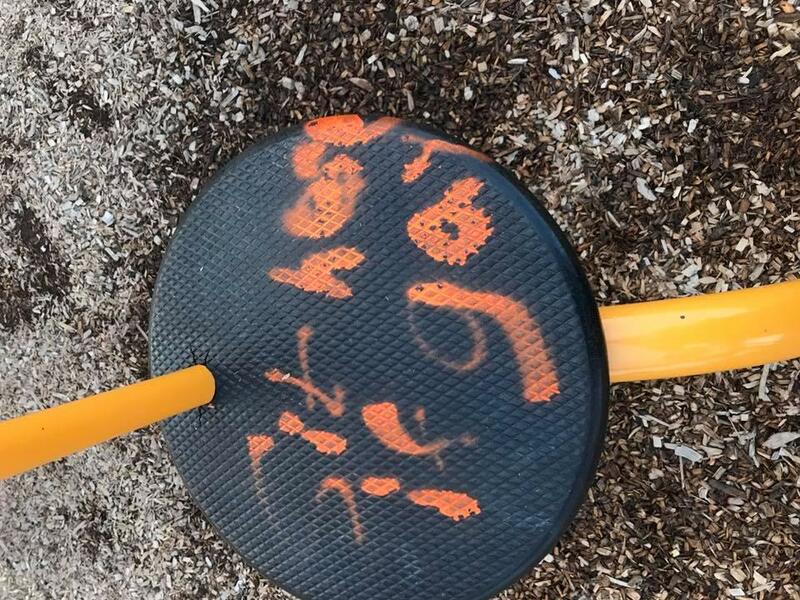 For the second time in about a week offensive and racist graffiti was written on a school playground. The words "sit here if gay" and the “N” word were discovered Sunday evening outside the Maple East Elementary School Williamsville. WBFO News received a written statement from the Williamsville School Central School District. It said the 'racist and foul' graffiti was found spray painted on the playground and on an outside brick school wall. Some of the graffiti written on the outside of the Maple East Elementary School in Williamsville. The photo has been cropped removing a racist comment on the brick wall. Amherst Police are investigating and took photos. The District said the graffiti consisted of racist and foul language, a sexual drawing, ‘Bills’, and random names. It was removed Tuesday morning. Offensive & racist remarks were spray painted on the playground at Maple East Elementary School. Last week racist graffiti was also removed from the Windermere Elementary School playground in the Amherst School District. 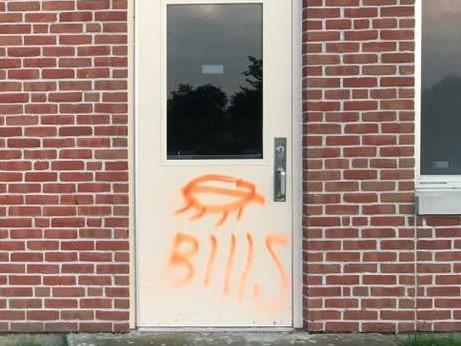 On Monday morning, August 21, graffiti was found spray painted on playground apparatus at Maple East Elementary, as well as the school’s outside brick wall and a window facing the soccer fields. The graffiti consisted of racist and foul language, a sexual drawing, ‘Bills’, and random names. The Amherst Police were notified, responded to the site and took photos. The inappropriate graffiti was removed completely as of Tuesday morning. The district is cooperating fully with the police investigation and, when found, will prosecute the perpetrators to the fullest extent of the law. A large group of parents and residents from around Windermere Boulevard Elementary School turned out Tuesday night to support the school in the wake of racist graffiti being found on some playground equipment.